Were Thomas Jefferson to walk the grounds of Monticello today, he would no doubt feel fully at home in the 1,000-foot terraced vegetable garden where the very vegetables and herbs he favored are thriving. Extensively and painstakingly restored under Peter J. Hatch's brilliant direction, Jefferson's unique vegetable garden now boasts the same medley of plants he enthusiastically cultivated in the e… arly nineteenth century. The garden is a living expression of Jefferson's genius and his distinctly American attitudes. 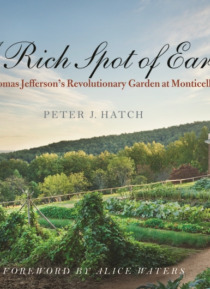 Its impact on the culinary, garden, and landscape history of the United States continues to the present day.Graced with nearly 200 full-color illustrations, "e;A Rich Spot of Earth"e; is the first book devoted to all aspects of the Monticello vegetable garden. Hatch guides us from the asparagus and artichokes first planted in 1770 through the horticultural experiments of Jefferson's retirement years (18091826). The author explores topics ranging from labor in the garden, garden pests of the time, and seed saving practices to contemporary African American gardens. He also discusses Jefferson's favorite vegetables and the hundreds of varieties he grew, the half-Virginian half-French cuisine he developed, and the gardening traditions he adapted from many other countries.